Most people are familiar with the Myers Briggs Step I instrument. This is the basic MBTI that tells you which one of the 16 available MBTI Types you might be. Ie ENFP or ESTP etc. It is the basic MBTI that most people are familiar with. Much less known is the MBTI Step II version which is rather unfortunate, because I find it a most valuable tool in developing increased self-awareness. What is the MBTI Step II assessment? When a person has a Facet result that is in keeping with their Preference Pairing, we say they are “In Preference” . In the example below, this person has an “In Preference” result on the Gregarious/Intimate Facet. Note the person is an Introvert – ISTJ. When a person has a Facet result that is NOT in keeping with their Preference Pairing, we say they are “Out of Preference” on that facet. So in the example below, this person has an “Out of Preference” result on the Enthusiastic/Quiet facet. Again, note the person is an Introvert – ISTJ. An introvert would normally be associated with Quiet. There is one more option available. It is possible to be in the “Midzone” on any Facet. That is they don’t have a strong preference either way on that Facet. In the diagram below, this is exactly how it looks. This person is an Introvert with a Midzone score on the Initiating/Receiving Facet. In fact they sit Midzone on two other facet preference pairings. As you can see the above information offers richness and depth to your MBTI Type that you just cannot get when using the basic MBTI Step I Assessment. 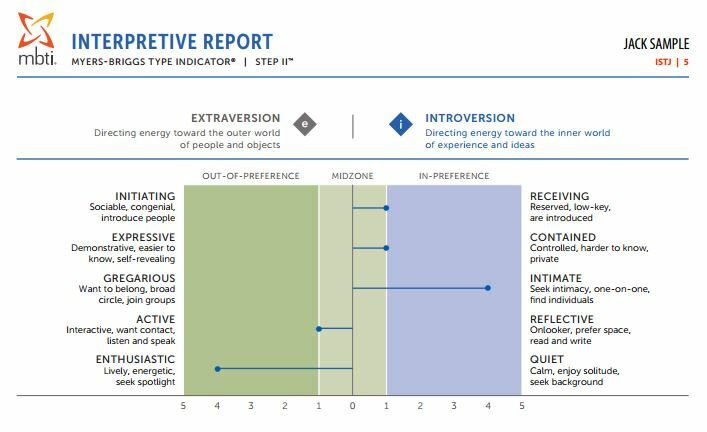 We now use the Step II Report in our Team Building programs especially for those who have done the normal Step I, MBTI before. It enables us to construct activities based on a person’s Facet results rather than just their normal Step I preference pairing. These activities can then really target differences within a Type and the results are normally very accurate and very insightful in terms of how a person might behave at work. Contact us today for more information on how the MBTI Step II Instrument can help your team to function more effectively with this new and intimate knowledge. And read some Client Feedback on how the MBTI Step II can be used in a team building workshop.